Some of the severest restrictions since Soviet times only allow for missionary activity on church property. The church has a massive cross in the center of the stage, and below it a baptismal pool. 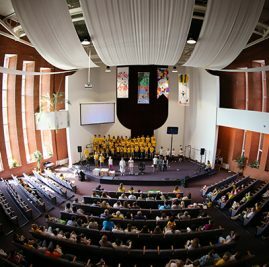 The worship band alternates between Hillsong and Matt Redman worship songs, as well as Russian original worship songs and hymns. Some in the congregation raise their arms in worship; others don’t. Then comes a time for shaking hands with surrounding attendees. After a series of church announcements, the pastor gets up and delivers his sermon. In short, the Russian Church has had the freedom to worship in many of the same ways we see in America. But the freedom for the way the Russian Church is allowed to reach into its community is about to change. In a law going into affect on July 20, Russian Christians will see a major part of their religious freedom go away. Claiming to be an anti-terrorist effort, the new policy is an amendment to a 1997 Russian law No. 125-FL, which controls missionary activity. Now, any missionary activity that is not taking place on legally registered church properties needs a special permit, along with other specific documents. The amendment will go into affect July 20. -What constitutes as “missionary activity?” Who can do it? What documents do missionaries need? Can someone invite a non-Christian to church? Can someone share the gospel with a friend? -Will believers meeting in apartments for Bible study or small groups be in violation, as they are not holding these activities on registered land? -An estimated 1,000 churches are meeting in properties legally registered under an individual. Will these be in violation? -Will the visas of foreigners be regulated more closely to ensure the actual activity matches the type of visa? Outside of Moscow, Russia a few weeks ago, a Russian evangelical church rallied around each other in prayer against this law. They knew it was going to severely affect the level of community, growth, and overall freedoms they had grown accustomed to over the past 25 years. And yet, they had resilience and a trust in God: despite their government, they were still going to be obedient to Christ and His Word. The full ramifications of the amendment will not be known until officials begin interpreting and enforcing it. Fellow American Christians can be in prayer for wisdom and understanding over this next step in the slow erosion of religious freedom in Russia.